Crafted in Andrea Felice's London Studio to order, the Rovi cabinet playfully reverses our relationship with a piece of fine furniture. You are at risk, rather than having to be careful of how you handle or open a more delicate piece of furniture. The unit is constructed of black pigmented high density fiberboard, which has been faced with 3mm aluminium sheet. The doors of the unit are mitred so that they seamlessly fit to form an exact boxlike structure. The original handle branches were hand-carved by Andrea Felice from Sycamore, with Holy wood thorns then cast using a polyester resin. Rovi is customizable and interiors can be finished to customer requirements. Limited edition of 9. 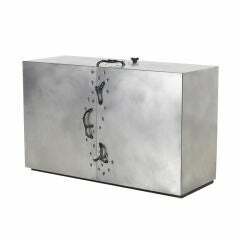 Cabinet is customisable to suite customers size and finish requirements. Please contact Andrea Felice for a full range of options. At Andrea Felice we produce high quality contemporary bespoke commission furniture from our Dulwich London studio. All our pieces are completely customisable to harmonise with our clients interiors so that we can meet their exacting requirements. An Italian born raised / London based Artisan, Andrea's work often incorporates hints of art-deco and metal. Andrea's will to experiment with materials combined with detailed cabinetmaking and carving know-how allows him to create unique and timeless pieces. This stylish credenza is constructed from blackened oak and is fronted with Corian doors and drawer which are offset by liquid and solid brass. Interiors are lined with Alcantara. 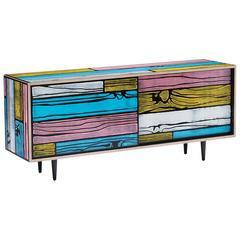 A great piece from Pace Collection use it for office or home. Great storage space and file drawers. 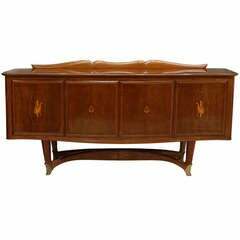 Sculpted studio cabinet, credenza or sideboard in walnut. This crafted woodworking piece has a Japanese esthetic.